We are greatly blessed with loads of public art in SE16. Much of it is unknown even to old timers so we thought we’d tell you a little more about what’s here to be seen on a stroll through SE16. 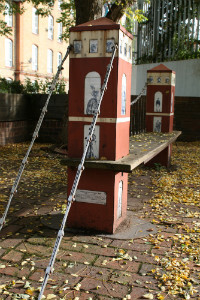 Suzie Bedo introduces a few of the more prominent pieces in Rotherhithe and Surrey Docks. In another post we will take a look at the art in Bermondsey, Southwark Park and Canada Water. With the four hundredth anniversary of the sailing of The Mayflower only a few years away, Rotherhithe will be a centre of American celebrations in 2020. “Sunshine Weekly and the Pilgrim’s pocket”, a bronze statue by local artist Peter McLean, can be found in Cumberland Wharf at the end of Swan Road. 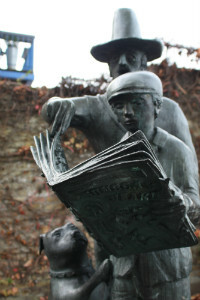 Unveiled in 1991, it shows the figure of a 1930s Rotherhithe newsboy reading the story of the Pilgrim Fathers in the ‘Sunbeam Weekly’. The figure of a 17th century “Pilgrim Father” appears behind him, surprised by what the future holds and a terrier jumps up at his feet. Rumour says if you leave something in the Pilgrim’s pocket, your life will have a lucky turn – so, go ahead and try it out! There are several artworks around the Museum, make sure you find them all! In the square you can take a rest on three benches shaped by local children to resemble bridges I S Brunel built at Maidenhead and in central London, the Hungerford and the Royal Albert bridges. The false acacia trees (robinia pseudoacacia) provide shade, one of which is held together by huge stainless steel bolts and as a result is known popularly as the Frankenstein tree. The shaft shows a mural drawn from a painting by Marc Brunel, acquired with help from The Art Fund. Next to Tunnel Road you can see a picnic table, shaped like a ship with seats for 20 people. And there is a cartoon train mural in Railway Avenue leading to Rotherhithe Station, recalling the days of a steam railway running through the tunnel. A statue by Jamie Sargeant of Christopher Jones – captain of The Mayflower on the 1620 trip to the New World – was unveiled on July 2nd 1995. Christopher Jones was buried in St Mary’s church in 1622 aged 55 years old. 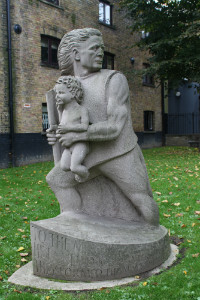 The memorial on a ship-shaped base shows St Christopher – the patron saint of travellers – looking back at the Old World (North-East) whilst the child in his arms looks towards the New World (South). The statue was commissioned by the Sons and Daughters of the Pilgrims. The sculptors Philip Bews and Diane Gorvin have been working together since 1986; several of their sculptures feature in SE16. When Fraser Borwick, the Area Landscape Architect for London Dockland Development Corporation suggested some live size animals walking towards the Surrey Dock Farm, they were commissioned to create Animal Procession. The piglets and the pigs were made by Philip, the geese and the cat by Diane and they both worked on Bo the donkey. Freya, their own cat was a model and Bo the donkey was modelled on one from Walton Hall Children’s Zoo. 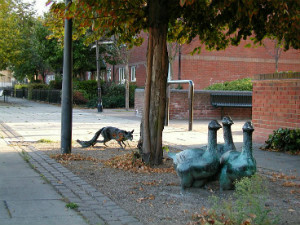 Other sculptors created other animals; Althea Wynne made the goats and Majan Wouda created the fox, chasing the geese (see left). The truth is that there are loads of public art that are not listed here in both Surrey Docks and Rotherhithe. We will have to come back and do some more on another occasion. What’s your favourite piece? What other local art do you think is worth celebrating and which do you think is the best of the lot? Let us know!